In April, we tracked acquisition and investment deals in CEE worth more than $35M. The covered startups come from Hungary, Romania, the Czech Republic, Serbia, Ukraine, Estonia, Lithuania, and Poland. Also, make sure you visit the Russian corner with $23M in funding and M&A deals. Credo Ventures, Perion and the Conor Fund have pledged €1.5 M to SignALL to bring their prototypes to life and enhance the communication between deaf and hearing people. The US is the target market for the startup as the translation will happen from the American Sign Language (ASL) to English. Other languages will be added later. More on the story. Catalyst (the 3TS Partner’s managed fund) has invested in the Romanian sales software platform Marketizator which provides the solution for the conversion rate optimisation. Funds will be spent on expansion to Brazilian, Japanese, Russian and the US markets. Details. Reportedly, the Swiss Group Ringier acquired Imobiliare.ro for $21 million in immediate cash with a postponed tranche of $10 million within 2 years. However, the news was updated several times, and the latest version mentions the sum of $10 million. Founded in 2000, Immobiliare.ro is biggest real estate startup in Romania with 30,000 unique visitors per day. Learn more about the Romanian success. The Czech independent game studio Wube Software reports that their retro-styled strategy game Factorio has sold 300,000 copies each for $10, which totals to $3M. The game with geeky old-school graphics offers players an opportunity to build and maintain factories. Earlier it raised 21,000 Euro on IndieGoGo. Learn more. Content Insights secured $1.1M from NBM fund, NEVEQ and Eleven. It is an analytical platform which calculates the level of impact created by the content placed in social media, blogs, on corporate websites. The founders expect that the solution will help in preventing the editors from focusing on sensational stories and shifting their attention to the qualitative performance of their authors. The solution is based on CPI, or Content Performance Indicator, which is a unique algorithm transforming the data into one figure that reflects the generated impact. Learn more. Catena Media becomes Europe’s fastest growing company in lead generation thanks to its latest €15M acquisition of the affiliate marketing website AskGamblers.com. AskGamblers is an authority of iGaming industry which stores reviews, ratings and complaints about online casinos. The company operates across Europe, including its top market – the UK. AskGamblers’ development center already employs 30 people in Serbia, and Catena Media is planning to further tap into the local talent pool. Official press-release. Innova Capital invested in the Polish provider of advertising and marketing technology Netsprint. The company, which claims to have 97% of Polish internet population covered monthly, plans to spend the funds on growing in Poland and internationally. Learn more here. The real estate startup Homsters unites three projects: two marketplaces in Kazakhstan and Vietnam and Prof.Estate – real estate digital marketing service platform. The company has recently gone through a $600K bridge round as a preparation stage for Series A. Form Capital and several angel investors from Vietnam, France, the Czech Republic, Poland and the USA contributed to this round . The company decided to go for a bridge round in order to expand to the Vietnamese market before the Series A. More on the story. HighBrow intends to make the education an everyday habit by providing bite-sized educational materials in 73 courses. delivered every morning via e-mail. Currently, both individuals and companies with expertise can submit a course. and HubSpot and YCombinator are among existing business contributors of HighBrow. The company will use the funds to spearhead the international expansion and establish B2B connections with companies. Learn more. One of the most prestigious product design award has chosen Ukrainian LaMetric Time of more than 5,000 of other products. 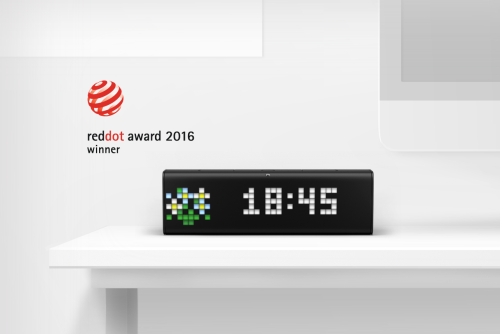 LaMetric is a standalone internet-connected clock with a LED-display that synchronises with Google Calendar, CrossFit, Apple Store, and displays the information the user needs. The skyrocketing Kickstarter campaign brought the startup total $370,001 from 2,215 backers worldwide (for the initial pledge of $69,000). More. Softneta, a Lithuanian healthcare software developer, received a €1M investment from the local private equity firm Practica Capital. The company will use the money for strategic improvements and the development of the company’s software, and hiring new people. More information can be found on Startup Lithuania.